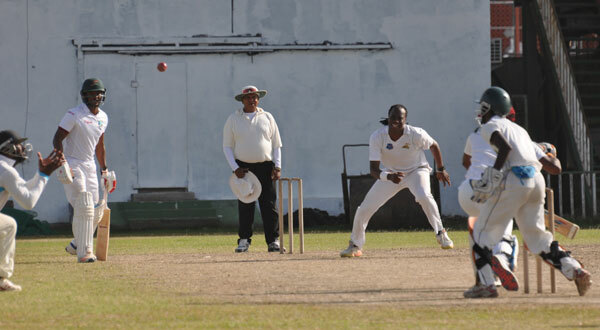 The latest round of the Georgetown Cricket Association (GCA) GISE, Star Party Rental & Trophy Stall First Division two-day cricket competition was dominated by the bowlers although West Indies batsman Rajendra Chandrika returned to form with an elegant unbeaten 149 for Everest at DCC. Test opener Rajendra Chandrika returned to form with a magnificent unbeaten 149 for Everest at DCC yesterday. 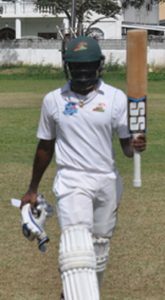 At Bourda, Malteenoes were bowled out for 199 as Kellon Carmichael led the way with 58 decorated with seven fours and a six. Nicosia Barker supported with 55 with 10 fours and a six, while Rawle Merrell (23) and Stephan Browne (18) were the other batsmen to get into double figures. Test player Leon Johnson, bowling a combination of off-spin, leg-spin and medium pace, had 5-25, while left-arm spinner Devon Lord took 4-13 for GCC, who were dismantled for 121. Winston Forrester (28) and Robin Bacchus (36) give GCC a solid 63-run opening stand before off-spinner Steven Jacobs (5-31) trapped Forrester LBW to trigger a collapse which left GCC on the ropes at 79-5. Jacobs and Vishal Narayan (4-23), back after nearly two years away from cricket, orchestrated the demise of the home team’s middle order. Johnson struggled for 38 balls for his 14 before he was bowled by Narayan, a former Guyana U-15 off spinner and only Lord and Stephan Wilson with 10 each, reached double figures after that. 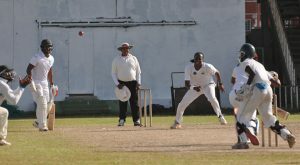 With a lead of 78, Malteenoes were seven without loss by the close of day one in which 20 wickets tumbled on a good track and sunny conditions. Leon Johnson watches from the non striker’s end as Windies U-19 player Renaldo Ali-Mohammed is caught by Marcus Watkins off Steven Jacobs who captured 5 wickets at Bourda. At DCC, the host were 194-6, 88 away from Everest’s 282 all out. Chris Barnwell hit four fours and six sixes in 89, while Windies U-19 World Cup batsman Raymond Perez made a shot-filled 63 with eight fours and six sixes. 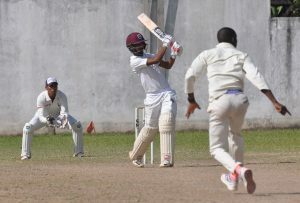 Windies U-19 batsman Joshua Persaud was the other batsman to reach double figures so far with 27. National left-arm spinner Gudakesh Motie and Windies U-19 all-rounder Bhaskar Yadram had two wickets each for Everest, whose total was built around an 87-run first wicket stand between the 28 year-old Chandrika and 21 year-old Tagenarine Chanderpaul (22), but once Ashmead Nedd, one of five Guyanese in the U-19 World Cup Team, bowled Chanderpaul only Travis Mohammed (18), Adrian Sooknauth (17) and Yadram (10) got to double figures. Chandrika, who has played five Tests and has a century and 13 fifties from 58 First-Class games, looked elegant and his on-drives and fluent cover drives were classy as he carried his bat after the last batsman was run out leaving him stranded. Nedd finished with 5-84 and Nkosie Beaton had 2-26. 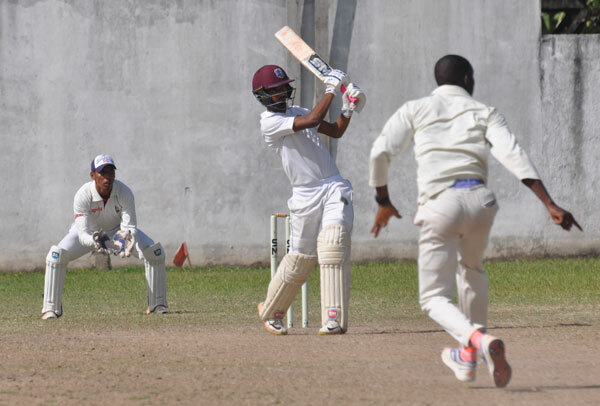 DCC’s Windies U-19 batsman Raymond Perez goes big during his shot-filled 63 yesterday. At Malteenoes, GYO were dismissed for 141 with only Treatlon Liverpool (27), Kishan Singh (28), Wazim Ally (24) and Richard Hoyte (14) getting double figure scores as off-spinner Gajanan Suknanand captured 6-39.